The Griddle opened for business in 1948. Originally operating from Memorial Day through Labor Day each year and serving breakfast, lunch and dinner. Purchased in 1960 by Mike and Betty Aboud it became a year round operation in short order. 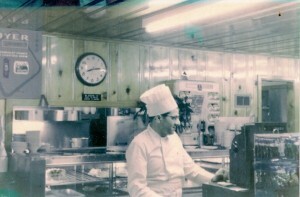 Through out the 1960’s the Aboud’s continued to serve breakfast, lunch and dinner. But in the early 1970’s they made a bold move and turned their attention to breakfast and strictly breakfast. Perfecting a homemade breakfast, the Aboud’s built a name and reputation that has become synonymous with “Good Cookin”. In the mid-80’s, David Aboud, Mike and Betty’s youngest son took over day to day operations and brought lunch back to the table. David continued to build on his parents’ reputation offering diner style fare with a gourmet twist and his mother’s homemade desserts. In 2005, David purchased all of the family holdings and shifted his attention to sharing The Griddle hospitality with other communities and friends through expansion.